You may have heard of otters, but have you heard of sea otters? These creatures are otters that live in the Pacific Ocean. They primarily live along the coasts of both North America and Asia. Not only are they cute, but they are also intelligent in many ways. Sea otters are the only otters that give birth in water. Parents teach their babies to swim and hunt alone. They take care of the babies by resting them on their stomach and floating together. Sea otters' water-repellent fur functions as a blanket and keeps them warm and cozy. Cleaning their fur in the ocean with their paws keeps them dry and fights off the cold. Their webbed feet help with swimming, along with their ears that close up so water can't get into their heads. Sea otters are big fans of lounging on their backs when they take naps. They float on the surface in areas full of seaweed and kelp. They do this to keep themselves from floating out into the ocean. 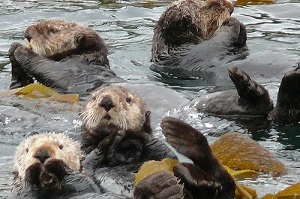 When sea otters are hungry, they grab rocks to smash clam shells until they open so they can eat all the meat inside. They also eat sea creatures such as sea urchins, crabs, squids, octopuses, and fish. Sea otters have smart ways to protect themselves and lead very interesting lives.